Summary: Try as they may, resin manufacturers aren’t able to ensure how muchiron can be removed by softening resin. Nevertheless, we can identify types of iron and proceed from there. 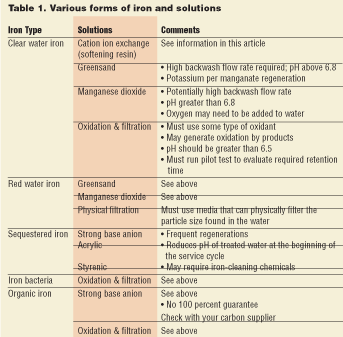 This article discusses iron in several forms and provide some possible treatment options with respect to ion exchange. Iron is commonly found in rocks and soil throughout the world. Under proper conditions, iron will leach into a water supply from these rock and soil formations. If iron is present in water and concentrations exceed 0.3 parts per million (ppm), staining can occur. This staining can affect plumbing fixtures, dishware and clothes, and can produce a yellow to reddish color in water. These levels may also affect taste and/or odor. The U.S. Environmental Protection Agency (USEPA) has set a secondary drinking water guideline of 0.3 ppm of water. This isn’t federally enforceable since it’s not considered a health risk. It may, however, be enforced at the state or county level. Municipalities may feed sequestering agents—like sodium tripolyphosphate, hexametaphosphate or sodium silicate—into the water to tie up metals like iron and keep them in solution. These sequestering agents will inhibit the precipitation of iron that might otherwise occur in untreated water, preventing the characteristic red stain. The problem with these types of agents is they can be broken down. As water treated with a sequestering agent passes through a hot water heater, the poly-phosphate or silicate bond can be broken. Polyphosphates can also revert to orthophosphates over time; in other words, they lose their ability to sequester iron. When these situations occur, staining can become a problem. Sequestering agents also will inhibit exchange of iron onto softening resins. Sequestered iron will pass through a water softener. This is a manmade issue and won’t occur in a well unless a water treatment dealer has added polyphos-phates to water. Polyphosphates may also be added to water to control corrosion of pipes. To test for polyphosphates in water, the total phosphate and orthophosphate concentrations must be known. The difference between these two values will be the polyphosphate. A minimum of 4 ppm polyphosphate is fed into the water to treat 2 ppm of iron or less. For every 1 ppm of iron above 2 ppm, an additional 2 ppm of polyphosphate must be added. Unfortunately, the polyphosphate will frequently be underfed so only a portion of the iron will be sequestered; the balance will be one of the other types of iron, which may require a different treatment solution (see Table 1). Laboratory tests indicate a strong base anion in the chloride form will remove about 90 percent of the polyphos-phate from water. Further testing has shown acrylic anions (frequently used for tannin removal) have a higher capacity than the styrene-based anion resins. The removal of sodium silicate is a little more difficult and requires use of a strong base anion in the OH form [regenerating with NaOH (caustic)]. Since an anion is being used in the OH form, the water must first pass through a cation resin in the hydrogen form (regenerated with an acid like sulfuric or hydrochloric). This type of water treatment is called deionization (DI) and is generally considered to be overkill for residential water treatment. Further field testing is required to verify both of these types of treatments and their limitations. DI can only be done in a portable exchange DI scenario, where exhausted tanks are taken back to a central regeneration station and new regeneration tanks are placed into service. Polyphos-phates are typically used in the United States while Canada frequently uses sodium silicate. 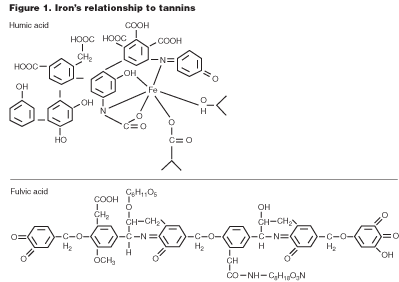 Iron can also be associated with organics such as tannins (see Figure 1). This is also known as organically bound iron or “heme iron.” Tannins are very large molecular weight organics that are a decay product of dead vegetation. Most common in surface water and shallow wells, tannins can cause water to have a yellow to brown color. These molecules have the ability to hold on to iron by a mechanism called chelation (claw). This type of iron won’t be removed by softening resin. accepted media for tannin removal; however, high water retention, styrene-based resins also are used with success. High water retention opens up the structure of the resin to allow organics to exchange on and off the resin more easily. Regeneration must be performed frequently with salt to reduce the potential for organic fouling. The longer the tannin remains on the resin, the greater potential for that organic to migrate into the resin bead and cause fouling. 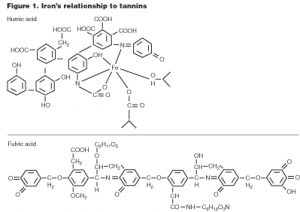 Tannin/iron removal by ion exchange can be a hit-or-miss proposition. Test units should be used for a period of time to verify performance. As with any anion resin, the pH of the water will drop during the first portion of the service cycle. Since this resin is used in the chloride form (Cl), the Cl content will increase on the treated water. Bacterial iron is actually a microorganism that utilizes iron in a metabolic process. In this process, the iron is precipitated to its insoluble state and deposited around the cell wall. Crenothrix, Clonothrix, and Gallionella are common types of iron bacteria. Water containing this type of iron will have a reddish color and may have an objectionable odor. Iron bacteria will commonly grow in the holding tank of the toilet. It can have a pink, stringy and slimy-looking appearance. If bleach is added to the tank, the bacteria will disintegrate and the iron will fall to the bottom of the tank. These organisms can live in a wide range of environmental conditions. To treat for this type of iron, the bacteria must be killed. Chlorine is frequently used to kill the bacteria. Disinfection of the entire water distribution system, including the well, may successfully treat this problem without reoccurrence. If the bacteria recolonize, continuous disinfection and physical filtration may be required. Iron is generally found in its oxidized state in nature, which is insoluble in water. Soluble iron, or clear water iron, that’s exposed to oxygen or some other type of oxidant will also precipitate to the insoluble oxide form. This type of iron will have a yellowish to reddish color in water and must be removed by a physical filtration process. Generally a 5- to 25-micron (µm) filter will remove this type of iron; however, smaller micron sizes may be required. Trial and error will play a significant role in sizing a filter media. Multimedia filters, garnet, sand, or anthracite are common filter mediums. Backwashing these products is critical since that’s how the iron is removed from the bed. It’s imperative the proper backwash flow be used to get the optimum bed expansion. Greensand and manganese dioxide beds will also work effectively. Though it’s not recommended, softening resin may filter out particles of iron that are greater than 40 µm in size. Particles of iron filtered out on top of the bed can be removed by backwash-ing. Residual particles that remain on the bed after backwashing can cause pressure drop and channeling. To remove these particles, a reducing agent is required to dissolve them. Be extremely cautious if an acid is used since hydrogen ions will be exchanged onto the resin. When the unit goes back into service, a low pH can result and regeneration of the resin back to the sodium form is necessary. It should also be determined whether or not the unit and associated plumbing are compatible with the acid being used. Citric and phosphoric acid are commonly used weaker acids along with sodium hydrosulfite and sodium bisulfite. If dissolved iron oxidizes, fouling can occur on the surface of the resin as well as within the internal matrix of the bead. This type of fouling reduces resin capacity and can allow excess iron to bleed through the system. There are correction factors developed in the industry to help size softeners for iron removal. A typical correction factor may state that for each ppm of iron in the water, multiply by a factor of 5 grains. This correction factor was developed to increase the frequency of regeneration and decrease the amount of iron fouling that might otherwise occur. Correction factors should be used as a general guideline and may have to be increased or decreased in a given area. Iron fouling effects can also be minimized with the use of chemical cleaners added into the brine regenerant. Sodium hydrosulfite and sodium bisulfite are examples of these cleaners. They’ll chemically reduce red water iron to clear water iron. A preventative maintenance procedure utilizing a reducing agent at a pre-determined interval of time will help keep the resin bed clean. Salt with a commercially available iron-cleaning chemical can also be very useful when iron levels are excessive. This will chemically clean the bed during regeneration, and it shouldn’t have any detrimental effect on the softening resin. In situations where iron fouling is heavy, the unit should be treated manually with a higher concentration of cleaner. Normally, the iron-cleaning chemicals added by the salt manufacturers are fairly low in concentration. Other treatments include use of sequestering agents like polyphosphates, chelating agents like EDTA, or an acid strip using hydrochloric acid, phosphoric acid or citric acid. Use of sequestering and chelating agents is expensive and usually isn’t economically feasible to clean small amounts of resin. Care must be taken when using an acid. The equipment must be compatible so corrosion doesn’t occur. If you’re unsure of a particular procedure, consult your resin manufacturer. Backwashing is a critical step in the regeneration sequence when dealing with iron. The backwash step causes a mechanical scrubbing of the bead that helps strip iron precipitated on the surface of the resin. Most resin manufacturers set a minimum specification of 50 percent bed expansion. This is usually accomplished with a backwash flow rate of approximately 5 gallons per minute per square foot (gpm/sq.ft.) for softening resin. When setting the backwash flow rate, remember the water temperature is critical. The warmer the water, the greater the flow rate required to expand the bed by 50 percent. The backwash will also help expel any particulate iron filtered out by the resin bed. Resin with a smaller particle size—“fine mesh resin”—appears to have greater ability to pick up and release clear water iron. The theory behind this material has to do with its greater surface area. There seems to be an enhanced absorption and desorption of iron from this type of resin because the exchange occurs to a greater degree at the surface of the material. Any fouling that might occur can more easily be removed since it occurs on the outer layer of the resin. Cleaning agents are also more effective on surface iron fouling. The last and probably most effective operational change that can be made occurs with the type of regeneration (see Figure 2). 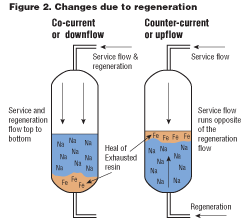 Countercurrent (up flow) regeneration, where the regenerant flow runs opposite the service flow, will lower iron leakage. Iron has an affinity to softening resin around calcium (Ca). When the service flow travels from the top to bottom of the unit, Ca and Fe will accumulate at the top of the resin bed. In a cocurrently (down flow) regenerated unit, the iron will be pushed down through the entire resin bed before exiting the unit. After regeneration, a heel of unregenerated resin containing both hardness and iron can be left at the bottom of the unit. The iron in this heel, as well as throughout the balance of the resin bed, can precipitate increasing iron leakage from the system. A properly engineered countercurrent system will instead leave a heel of unregenerated resin at the top of the bed. The bottom of the resin bed is contacted with virgin salt, so it’s the most highly regenerated region of the resin bed. The salt doesn’t contact the iron until it reaches the top of the resin bed and pushes the iron immediately out of the unit. There will still be a heel of exhausted resin but it will be at the top. Except for the top of the bed, the balance of the resin is exposed to little iron if correctly operated. To maximize countercurrent operation, it’s necessary to avoid fluidizing the bed. This can be accomplished by packing resin into the tank, installing a screen, or placing polyethylene beads on top of the resin. When a fixed bed isn’t used, the regeneration flow must be reduced to keep the bed expansion below 10 percent to avoid turnover. Brine pulsing can accomplish this same effect. The brining cycle may also be used as the backwash step. System testing is suggested. Obviously, water with a higher amount of suspended solids should be avoided or, at the least, pre-filtered. The use of a 5-µm pre-filter should help eliminate buildup of suspended solids. This buildup on the bed can cause channeling and pressure drop. If iron precipitates in this type of system, a reducing agent can be used to clean the bed. In many applications, it may be impractical or impossible to prevent the bed from fluidizing. Even if the bed fluidizes, the iron should be pushed out of the system during regeneration. A small portion of the iron may still end up distributed through the resin bed, but it won’t leave the iron at the bottom of the unit as will a cocurrently regenerated unit. Countercurrent regenerations don’t have a significant effect on operating capacity; however, hardness and iron leakage are kept to a minimum. Such regenerations are also more efficient than cocurrent regenerations since less salt is actually needed to achieve low leakage. Generally, lower amounts of rinse water are required to rinse this type of unit, which is critical in areas where water usage must be kept to a minimum. Questions are often asked as to the amount of iron that can be removed by softening resin. This is an extremely difficult question to answer. Standard softening resin can remove up to 600 grains per cubic foot. Such iron must be ferrous in nature because any other form of iron won’t be removed by softening resin. Remember that regenerations need to be performed frequently, even if the resin’s capacity isn’t totally expended. Many guarantees may state a unit will handle up to a certain amount of iron. Be wary of them. As a resin manufacturer, there’s no way to guarantee the amount of iron that can be removed by softening resin. First, if water has been tested and found to have 5 ppm of total iron, it could be in any of the forms discussed in this paper. Unless that iron is ferrous in nature, softening resin won’t work effectively. Second, equipment design is critical. Third, long-service cycles will precipitate a greater amount of iron than short-service cycles. Therefore, these situations make it impossible for resin manufacturers to pinpoint softening resins’ capacity for iron removal.